I have a 226 in my 48 F1. Mine is complete and running. I might be able to help with any questions, just don't have any spares. I would like to know about your drive train. a big consideration for flathead performance. I got a nice surprise when I went for the mail! Good deal John and thanks for the postage check. So you are not Ricardo? You are the previous tight end coach, John Strollo, for Bill Obrien at PSU? oops, sorry. PSU is my team and we are plowing forward in the rebuilding process after some very bad times. Let me know if you need any help getting that 226 running. I had a feeling you were a Nittany Lion fan!!! the kids were great players, but more than that, great people! I'm trying to decide if I should drill out some threads in a 47 bellhousing? So i am in the process of rebuilding a ford 226 h series, slowly might i add. I have never heard it run since we got the 1943 ford 1/2 ton back in roughly 2000. We have machined the the engine, new pistons, bearings, etc. And got it all back together, got a harness roughly wired and got it to turn over but no spark (still working on that), but then noticed a steady drip from the bottom part of the water pump flange. Do any of you with experience in this engine have any thoughts on what would cause that? It has a new gasket. Any help is appreciated. You say "water pump flange". Do you mean the flange on the shaft that the fan bolts to? So i am in the process of rebuilding a ford 226 h series, slowly might i add. I have never heard it run since we got the 1943 ford 1/2 ton back in roughly 2000. We have machined the the engine, new pistons, bearings, etc. would cause that? It has a new gasket. Any help is appreciated. Looking at the thermostat housing, it looks unlike mine. Also, H series took over for G series in late 48’ (or was it ‘47?). Could you have some attempted combination of mis-matched parts? The water pump has not been rebuilt. I did call the local napa store and they can ship it about 40 min away to have it rebuilt, cant get a quote until they see it. Looked around for a new one prior to putting the engine back together and couldnt find one since they seem hard to find as you all have noted. Not sure about the thermostat housing being different. This was the one that came on the engine. 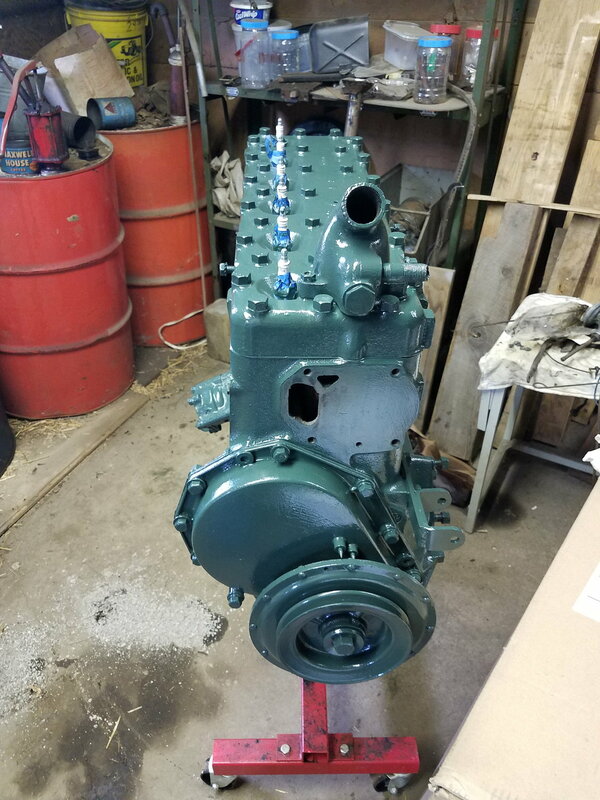 The 226 went from g to h in 1948/49 i think so its not the original one from the truck since the repair manual i got for the engine was from an f-1 (was an army truck in ww2 given the olive drab color in under dash areas). We actually got a g series engine too sitting in the barn now that was initially sitting in the bed of the truck while the one in reference was under the hood. If i have to take the pump off maybe i will just swing it over to napa and get it rebuilt. I will also try and clean up the block where it mounts. Thanks for the help...now if one of you could come to Michigan to get this thing running. Find TDC on cylinder 1 and your timing mark should be at the pointer or very near by (look in spark plug hole for top of piston to make sure your not off 180 degrees). There are many ways to do this, I've also done it by pulling the plug and sticking my thumb over plug hole and bumping starter waiting to feel compression then I look for the approaching timing mark alignment. Then set your distributor and rotor to be pointing at number one. Air,fuel,spark and she should fire. I'm not a mechanic by any stretch and I've gotten 4 of these things to run, some better than others. The G engines were introduced with the 48 truck model year. If the truck you're working on was produced earlier - especially if it was military, all bets are off. Certainly the thermostat housing is not G series. These are fairly forgiving engines with simple systems. I'm sure you'll get it fired. That series engine was used in industrial applications. Who knows where that housing may have originated. Again thank you all for your insight. I will be sure to post when and if i get it going. Wish me luck! I recall that thermostat housing being used on marine engine conversions in the '50's. 52 F-1 dash temp gauge... I am stumped.